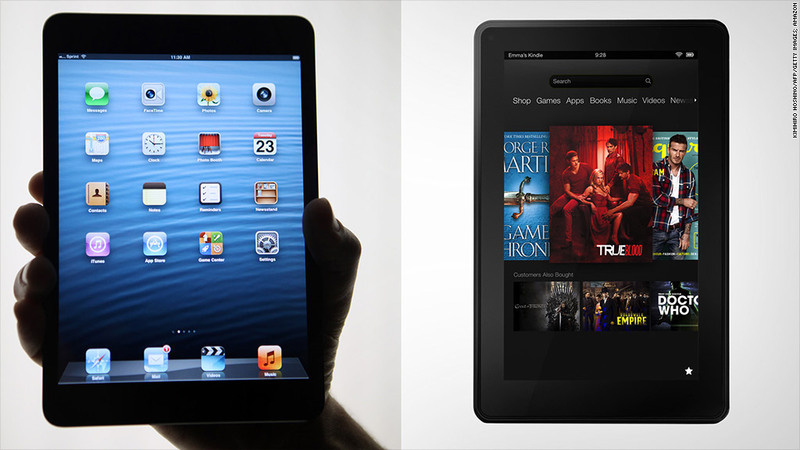 Android-based devices like the Kindle Fire (right) are eating into the iPad's market share. IDC issued a preliminary report on global tablet shipments across the world revealing that we've hit a long-expected milestone: Android tablets seem to be outpacing the iPad. IDC's fourth-quarter estimates show the overall tablet market expanding rapidly, and Android is grabbing a large chunk of that growth. Apple (AAPL) tablets -- which include the retina iPad and iPad mini -- dropped below 50% market share for the first time. Apple's fourth-quarter share of shipments came to 43.6%. It's still the top vendor by a mile, but the the combined market share of Android tablets -- coming from Amazon (AMZN), Asus and Samsung, among others -- easily topped 50%. Microsoft (MSFT) shipped 900,000 Surface tablets last quarter by IDC's estimate, representing 1.7% of the total market. IDC estimates Amazon's Kindle shipments at 6 million, making up 11.5% of the market. Amazon and Microsoft have not publicly commented on their tablet sales figures. Apple held over 90% of the tablet market share as recently as 2011, largely because Google (GOOG) had not yet widely distributed its tablet-optimized version of Android. Amazon released the Kindle Fire -- which uses a heavily customized Android build -- in late 2011. After that, it was only a matter of time before Apple's dominance slipped. The iPad is still the single bestselling tablet, and the most influential. But because Google allows anyone to make and sell an Android device, the range of Android tablets is much larger -- and they're often cheaper than Apple's offerings. This is the exact same cycle the smartphone market went through over the last five years. In that field, Apple has been content to concede some of its market share to protect its margins. We'll see if the tablet market shakes out the same way.